This 50-seat Embraer 145 jet was carrying 28 passengers from Newark, New Jersey, to Presque Isle for United Airlines when it landed and slid off the runway on March 4. 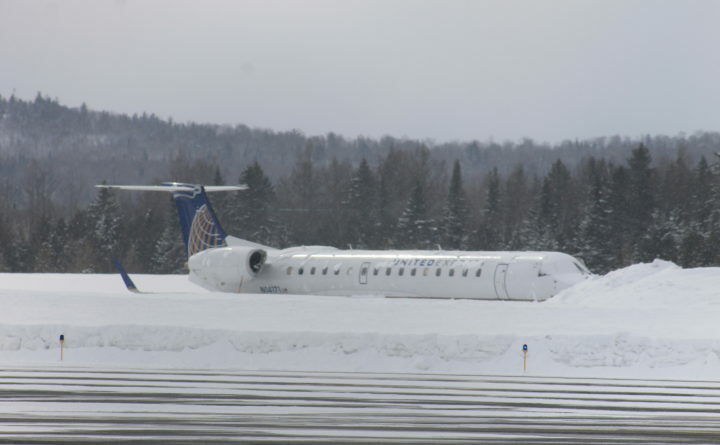 After more than a week without passenger air service in Presque Isle, United Airlines’ flights resumed Wednesday evening. Air service at Presque Isle International Airport resumed with a flight arriving shortly before midnight from Newark, New Jersey, said Kim Smith, public information officer for the city of Presque Isle. The airport had not seen any passenger air flights since March 4, when a 50-seat Embraer 145 jet operated by CommuteAir for United Airlines had an accident while landing. The accident left several people with minor injuries and the plane badly damaged. It also set off a federal investigation by the National Transportation Safety Board. Terry Williams, a spokesman for the NTSB, said that the aircraft was taken to a secure location for further examination, and that a preliminary report on the incident would likely be issued early next week. The full report with an analysis and conclusion of what led to the accident will not be completed and issued for about a year, Williams said.